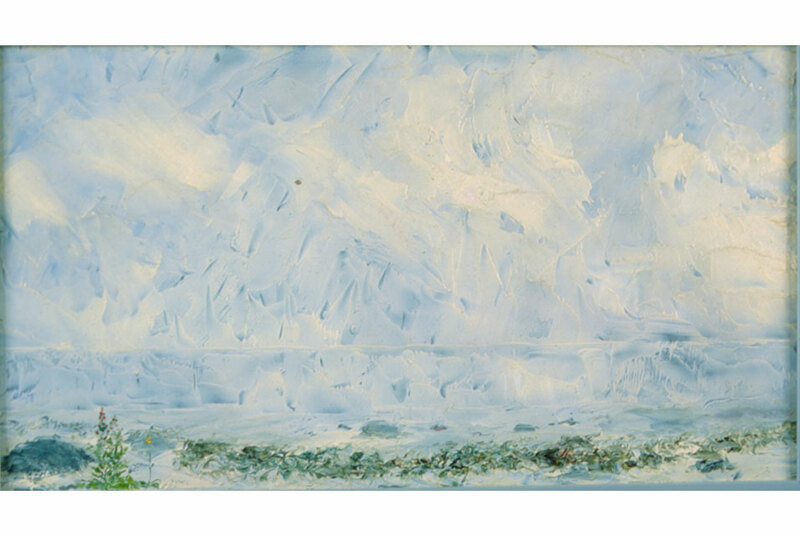 August Strindberg, Blomman vid stranden, 1892, Painting. KRISTIANSAND.- Screaming from the Mountain: Landscapes and Viewpoints is a large scale exhibition examining the Northern European landscape tradition, departing from the painterly tradition of Romanticism, but with its main focus on how this can be mirrored and re-contextualised through contemporary art practices. The viewpoint proves as important as the view: where you stand in regards of geography, history, gender, poweror if you actually are not looking at a landscape at all, but on the genre as such. Screaming from the Mountain involves some 70 artists and is exhibited on all three floors of SKMU, displaying works in medias ranging from painting and sculpture to video and installations, as well as works of great historic value. Most of the artists originate from Northern Europe or the Nordic Countries, but far from all. With a number of generous loans from Malmö Art Museum, organizers have been able to include several immensely interesting works, like a painting by Swedish playwright August Strindberg, and group of drawings and paintings by the Swedish landscape painter Carl Fredrik Hill (18491911), who during the latter part of his life suffered from schizophrenia under which he produced several thousands of drawings. Kitty Kielland, Amaldus Nielsen and J C Dahl are among the historic artists that connect to the strong landscape tradition in Norway. Several sub-themes are visited in Screaming from the Mountain: The Garden of Desire (Rococo/Pre-Romanticism); The Mapping Eye; Utopian Landscape; Race, Gender and the Heroic Landscape; Landscape and Ideology; The Inner Gaze (Landscape and Madness); Conceptual Landscapes. Screaming from the Mountain widens the perspectives on the Northern European painterly tradition by including the works of several internationally renowned artists. Isaac Julien's (UK) video triptych True North (2004) re-visits the legendary Robert Peary expedition exploring the North Pole, but places Matthew Henson, the man-servant of Robert Peary, under the headlight. Who actually reached the pole first? In a poetic and beautiful imagery, Julien exposes the racism hidden behind the heroism of polar exploration. Mariele Neudecker's (Germany/UK) oeuvre is mainly concerned with the concept of landscape and Romanticism, which she has examined and re-interpreted in a great variety of techniques and inventive approaches. Job Koelewijn (NL) has dealt with landscapesand viewpointsin an imaginative way, more concerned with the vision and place of the viewer than with landscape itself. From the conceptual approaches of Koelewijn, there are clear connections to several younger Nordic artists and their practices. João Penalva's (Portugal/UK) film Kitsune (2001) plays mockingly with our expectations on the landscape genre. We believe that we are watching a Japanese landscape, and listening to a folkloristic story told as a dialogue between two Japanese men. Only at the end do we realize that we have been fooling ourselves all the time, and only seen what we wanted to see in the landscape in front of us. Cornelia Parker (UK) has often returned to the ideological charge of objects. Her photographs of the sky, taken with the camera owned by Rudolf Höss, one of Nazi Germany's most notorious war criminals, puts the seemingly innocent and natural into a more perverted and evil perspective. Also other of her objects deal with the ambiguity of our understanding, split between the commonplace appearance of what we see and the change of meaning resulting from our knowledge of these objects. A K Dolven (Norway/UK) has examined relationships between light, body and time in the Arctic parts of Norway, in works that always express a deep understanding of human experience. Milena Bonilla (Colombia) has investigated the global roles of plants, landscapes and places. Bonilla resides at the Rijksakademie in Amsterdam, and her works will be thematically integrated with our collection also after the exhibition closesa project line called Opus Incertum. Christine Cheung (Canada) examines the media of water colour in large as well as small scale. Some of the works presented here are produced during a residency in Kristiansand, where SKMU is situated. Dorothy M. Yoon (South Korea) has in a recent series of photographs dealt with historic and cultural ambiguities along the crosslines of Rococo and Buddhism, fine art and fashion. Screaming from the Mountain: Landscapes and Viewpoints is curated by the director of SKMU Pontus Kyander. Mr Kyander from 1 October 2011 will be the director of Trondheim Kunstmuseum. Adel Abidin (IRQ/FIN, 1973), Jorann Abusland (NOR, 1977) Milena Bonilla (COL, 1975), Elina Brotherus (FIN, 1972), Ann Böttcher (SWE, 1973), Christine Cheung (CAN, 1979), Cecilie Dahl (NOR, 1960, Johan Christian Dahl (NOR, 1788-1857, A K Dolven (NOR/GBR, 1953), Thora Dolven Balke (NOR, 1982), Benny Drøscher (DEN, 1971), John William Edy (GBR, 1762-1820), Dag Erik Elgin (NOR, 1962), Juan-Pedro Fabra (SWE, 1971), Matias Faldbakken (NOR, 1973), Marcelius Førland (NOR, 1891-1978), Fine Art Union (NOR), Peter Fischli & David Weiss (CHE, 1952 and 1946), Eirik Gjedrem (NOR, 1959), Ane Graff (NOR, 1974), Sidsel Hanum (NOR, 1955), Carl Fredrik Hill (SWE, 1849-1911), Preben Holst (NOR, 1974), Sabine Hornig (GER, 1964), Sasha Huber (CHE/FIN, 1975), Isaac Julien (GBR, 1960),Pasi Eerik Karjula (FIN, 1964), Kitty Kielland (NOR, 1843-1914), Karen Kilimnik (USA, 1955), Job Koelewijn (NLD, 1962), Antti Laitinen (FIN, 1975), Matts Leiderstam (SWE, 1956), Petra Lindholm (FIN, 1973), Susanna Majuri (FIN, 1978), Elias Martin (SWE, 1739-1818), Søren Martinsen (DEN, 1966), Grete Nash (NOR, 1939-1999), Mariele Neudecker (GER/GBR, 1965), Amaldus Nielsen (NOR, 1838-1932), Anna Nordenskiöld (SWE, 1950), Kjell Nupen (NOR, 1955), Henrik Olesen (DEN, 1967), Gustaf Wilhelm Palm (SWE, 18101890), Cornelia Parker (GBR, 1956, Linn Pedersen (NOR, 1982), João Penalva (PRT, 1949), Peter Adolf Persson (SWE, 1862-1914), Charlotte von Poehl (SWE, 1966), Leonard Rickhard (NOR, 1945), Nina Roos (FIN, 1956), Jukka Rusanen (FIN, 1980), Torbjørn Rødland (NOR, 1970), Vilde Salhus Røed (NOR, 1981), Nina Saunders (DEN, 1958), Mari Slaattelid (NOR, 1960), August Strindberg (SWE, 1849-1912), Joseph Magnus Stäck (SWE, 1812-1868), Outi Sunila (FIN, 1970), Ann Beate Tempelhaug (NOR, 1954), Inga Svala Thorsdottir (ISL, 1966), Marit Tingleff (NOR, 1954), Carly Troncale (USA/NOR, 1977), Signe Vad (DEN, 1967), Apollinary Vasnetsov (RUS, 18561933) Marko Vuokola (FIN, 1967), Per Wizén (SWE, 1966), Dorothy M Yoon (KOR, 1976). Cantor Arts Center to Exhibit Richard Serra's Monumental Sculpture "Sequence"